I'm using android 8.1 and for the life of me I can't get my phone to ring on incoming calls. I have a tone set and the volume is maxed but no ring tone plays when a call is received. When I look at the notification channels for incoming calls on the phone app the notification sound is set to "none" and the option is greyed out so it can't be changed. Has anyone seen this or know how to change it? 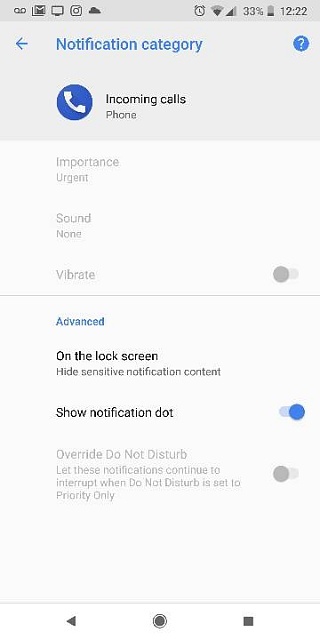 Please open the Phone app, tap the three-dot menu at top-right, then Settings, then Sounds and vibration. What is the phone ringtone set to? By the way, you say you are on Oreo 8.1 and a Pixel 2 phone (which one? XL?). I am looking at a Pixel 2 XL with 8.1 and I simply cannot find the exact screen you pictured above. How did you get to it? I have the same issue on my Pixel 2 (smaller one) running 8.0. I can call my husband's Pixel 2 and his phone rings, but I cannot receive calls. My phone doesn't vibrate, there's no message until after the phone call has been aborted. Then I get a message about a missed call. Unlikely, probably, but open the Phone app, tap the three-dot menu at top right, tap Settings, tap Call blocking. Make certain that your husband's phone number isn't listed there. Another possibility - main Settings -> Apps & notifications -> Advanced -> Default apps -> Phone app. It should be set to "Phone (System)"
It's actually set to a ringtone that I made. Okay; my screen for incoming call notifications looks exactly the same as yours (with the exception that I also have a toggle for "Blink light" - probably because I have that enabled elsewhere). And, yes, my phone does ring. Have you tested with one of the default ringtones? On your previous phone, did you ever install a third-party phone app? If so, some of your settings may have gotten screwed up when you set up your new Pixel by importing from your previous phone. Can you check the default phone app as I described in my previous post? Thanks, N4Newbie. All of those were set like you suggested. After an hour of fiddling with any setting I could find, rebooting my phone, and my husband rebooting his, I can hear it ring when he calls. Oddly, the screenshot in the OP is still exactly what mine looks like. Weird. But as long as I'm getting phone calls I can hear, I am ok.
My previous device was the first gen Pixel XL. I never used any third party dialers or anything like that. I honestly never thought to test other ringtones however, rebooting the phone seems to have fixed the issue. But, I'm still at a loss as to why this happened in the first place as I never changed any settings to either cause or fix the issue. I'm hoping that this was just a fluke. Unfortunately I won't know for sure unless I miss another call. "It's actually set to a ringtone that I made. " My guess is that is your problem. It might be a ringtone that the phone won't recognize or play for some reason. Try setting it to a normal ring tone. Ca_lvn and GSDer like this. Trying this out now. Awesome if it works. I've had to reboot my phone multiple times over the last month or two. it has also been difficult to answer calls at times when connected to my cars Bluetooth since the last update so hopefully this will fix both issues. Have this same issue on my phone and my wife's. Both are Pixel XL (originaly, not Pixel 2XL) running Android 8.1. After a restart, phone rings fine for a while. Then, after a while (half a day, a day..) it won't ring at all. Do Not Disturb is not enabled nor do any automatic DND settings exist. A custom ringtone is selected, and changing the ringtone won't fix it. Ring volume (and Media volume) is definitely at 100%. Only solution is to restart and then wait to restart again once it stops working again. Tried the Bluetooth In-Band Ringing fix via Developer Tools - didn't help. I have the same exact issue as the OP on my Pixel 2 XL with v8.1.0 for the last few weeks. I've tried rebooting multiple times. My Incoming Calls notification screen looks the same. The Sound says None and is grayed out. What the heck!? I'm missing many calls because the phone doesn't even vibrate until the caller hangs up. A pretty serious bug if you ask me. This is my first smart phone and wow what sour feeling to spend this much money on a phone that doesn't even make a noise when it rings. Is there a possibility you might have accidentally turned on the "Do Not Disturb" icon? Sadly the issue occurs on my mom's phone, so I couldn't grab the bug report right after it has occurred. Please, if anyone here has the issue, report about it with a bug report file on this issue tracker website. Try to tell Google as much information as possible about the issue. Could you try rebooting into Safe mode and see if the problem still occurs? I'm having the same issue on my pixel using Oreo. Sometimes a call will ring through and sometimes it goes straight to voicemail. This is a relatively new problem. Up until recently all calls rang through. I did notice the under set ringtone it said unroute to voicemail on one that did not ring through. I switched it to route to voicemail and it worked the next time so we'll see if that was the trick. I may be way off but hit the volume up and check the bell icon shows at the end of the volume slider graphic and not the vibrate icon. it could be a simple as that for some. if it is, hit the icon to toggle to sound. I have some additional information on this issue. I just got a new Pixel 2 XL. IT DOES NOT RING! Does not matter whether I use stock or custom ringtone BUT if I go to contacts and assign a custom ringtone to a user...it rings perfectly. I'm going to check out if the Samsung S8 XL has a ring problem and if not, I am returning my phone to the vendor as there is obviously no desire to address the issue by Google. No word. No comment. No update on an issue that was posted in NOVEMBER. Better to deal with the bloat than a phone that won't ring. Google..this is kinda a MAJOR issue to ignore. I've had the same issue on my 6P with 8.1. The phone wouldn't ring, nor would I hear notification sounds. I did a hard reset through Recovery and it's working again. I think I accidentally turned mine on with the Active Edge squeeze function. I knew that you could silence an incoming call using the squeeze feature (I use that frequently) but I didn't think you could turn on DND by simply squeezing. My phone turned off and now almost everything is gone? How can I uninstall duo on my phone with app is know knews in my country New Zealand?